Grow Your Business. ENJOY Your Life! For those in Direct Sales and Network Marketing, I wanted to let you know about a free training resource called The Mind Aware Show for Direct Sellers. Some of you may have heard of this series and the host of the show, Dana Wilde. For those who have not, Dana is the creator of Train Your Brain (TYB), which outlines the techniques she used to build her direct sales team from zero to a million dollars in record time. For more info on TYB visit www.monicaramos.tv/tybfree (it’s the program I attribute 100% of my success to). It’s the 5th season of The Mind Aware Show for Direct Sellers and the theme is “Straight from the Top!” I’m excited to announce that this season, I WILL BE ONE OF THE GUEST SPEAKERS!!!! The Mind Aware Show caters to home party-plan consultants, network marketers, and direct sales professionals looking for simple, time-saving, revenue building approaches to success. I am very honored that Dana has asked me to be on this incredible panel of experts and industry leaders. My interview airs on May 21st, but there are 23 other amazing leaders and trainers from various different companies being interviewed in this 4 week training series that begins May 5th. So register right away to take advantage of this free training series. Over this 4 week period in the month of May, Dana will be interviewing leaders from 24 direct sales companies offering their best tips on how to achieve success in this industry. If you miss an interview you will have the opportunity to get the replay as long as you are registered. 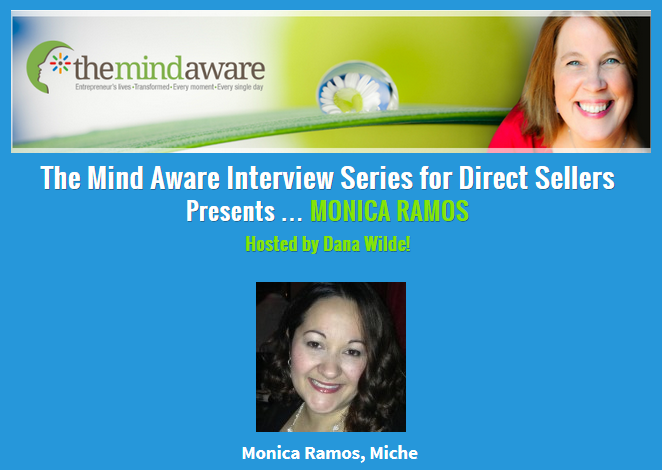 That link again is www.themindaware.com/Mic5Invite and it’s completely free to listen to all 24 interviews. The first one is Monday, May 5th. Mine isn’t till May 21st but they are all going to be great, so register right away. And share the link with your teams so they can all benefit from this training too! And Much Much Much More! TO RECEIVE A FREE COPY OF MY INTERVIEW AS AN MP3 DOWNLOAD, CLICK HERE! Limited time offer! This entry was posted in Direct Sales, Party Plan, social media, sponsoring, training resources by Monica Ramos. Bookmark the permalink.